The story of how suffrage activists crashed the 1876 centennial on July 4th! 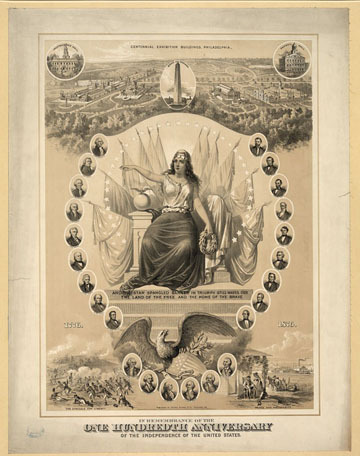 There are some treasures in the national storytelling archives of our nation, and one of them is about how suffrage activists crashed the national centennial celebration in Philadelphia on July 4th in 1876. Check out the story in an audio file. It’s quite amazing. Last year on July 1st the “Spirit of 1776” suffrage campaign wagon celebrated the centennial of its first journey on the road in 1913 with Edna Kearns, Serena Kearns, and Irene Davison. There’s an effort underway to get the old wagon out on the road again in 2017, and we’d like you to be involved. Just send an email to: suffragewagon at gmail.com and you’ll be brought up to date on how you can help. You can subscribe to Suffrage Wagon NewsChannel for regular campaign updates. This entry was posted on July 1, 2014, in Blog and tagged suffrage centennial, suffrage centennials, suffrage wagon, Votes for Women, womens suffrage. Bookmark the permalink.